Home Shopping Network Jobs Let You Work From Home! Published June 18, 2012 By Anna T. This post may contain affiliate links. Regardless, I only recommend sites I've researched and/or used and trust. HSN (Home Shopping Network) is a company I see advertising work at home positions quite frequently. As you probably know, HSN is a very well-known company that has been around for a long time. Additionally, Home Shopping Network jobs allow you to work from home doing sales and work from home customer service. This is location-based work and the locations vary. However, I frequently see the positions open in areas of Florida, Ohio, Tennessee, and Virginia. How much do Home Shopping Network jobs pay? The customer service positions start at $11 an hour and the sales positions start at $10 an hour. Your training time is also paid. In addition to paid HSN work from home training, you also get paid time off, 401K, and employee discounts. People who work full-time can also receive medical insurance. You can begin receiving these benefits on the first day of the month following your hire date. Related: List of work from home jobs with benefits! You are going to be completing sales transactions, addressing customer concerns, and also some upselling which you will receive incentives for. All calls for both sales and customer service positions are inbound. Most importantly, as stated above, you must live in or around one of the three areas they are hiring. They also prefer if you have had some customer service or sales experience in the past. In addition, it's necessary that you're comfortable navigating a personal computer with Windows, Outlook, etc. You can check Home Agent Headsets to purchase what you need for making/taking calls for HSN. They have the phone equipment specifically for HSN listed for sale. What do most people say about working from home for Home Shopping Network? The best place to check for this type of info is Glassdoor, where you can find reviews of various companies from former and current workers. Just do a search there for HSN or Home Shopping Network and you'll find a lot of reviews. The company has a 3.5 out of 5 rating there, which is not bad at all. 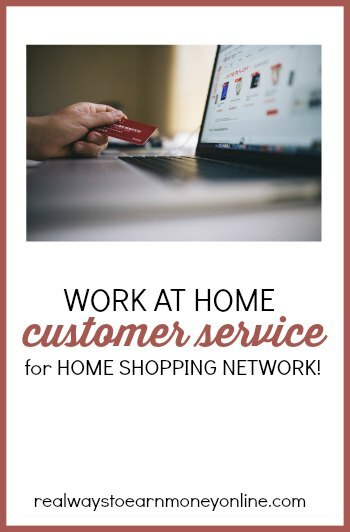 Would you like to apply for Home Shopping Network jobs? You can browse the open positions here. Good luck! Looking For More Legit Work at Home Jobs? Here are a few things you can do (or do all 3!). Check out my e-book with a list of 150 companies that regularly hire home-based workers. Get a membership to FlexJobs, the most trusted job board with flexible and remote work that is guaranteed to be scam-free. Get 30 percent off a membership with promo code AFFILPROMO. Visit my work at home job leads page to see what companies have had work at home openings recently. Good luck in whatever you choose to do! I work part time for HSN. I just got out of training a week ago. You can tell the difference between companies that care about their employees and companies that don’t? HSN does. Is the training self paced? How would I know whether they are hiring here in Springfield, IL region or this job is open only for FL region? Kindly let us know I have tried checking their sites, but there is no info given on hiring!